La Mandarina de Newton is pleased to invite you to the 1st Mandarina Beer Cafè Session!! From La Mandarina de Newton we aim to contribute as citizens of Barcelona to create a space, the Mandarina Beer Cafès, where we can discuss the topics we are passionate about: science, art, technology, design and learning. We have chosen a topic that motivates us a lot and that has to do with knowledge, memory and learning: The Body of Knowledge. That is, the kind of knowledge that originates from the fact that we have a body, we experience with that body and that body exists in a specific context. During the different Beer Cafès sessions (several Fridays, to be defined) we will be exploring different ways of understanding the body, the knowledge and we will be contrasting different ways of understanding them, some will be more phenomenological, others more biological and others will be influenced by the artistic experience of the body and the movement. The 1st session will take place on Friday, November 21, at 7 pm, at the Mandarina Space. How to innovate on/in/from Science Parks? The Autonomous University of Barcelona (UAB) created in 2007 the UAB Research Park (Parc de Recerca UAB, PRUAB) as a space to enable technology transfer from its important research assets. This park has several peculiarities. On one hand, it is not restricted only to the departments and research centers of its university, UAB, but it also includes other institutions who are present in the campus such as the research centers of the CSIC and the IRTA, for example. On the other hand, it has a distinctive feature compared to other geographical concentrations of researchers, i.e., the fact that you can find in a very small area research capabilities in both basic experimental and social sciences. Thus, the list of spin-offs that have been created from the efforts of the Park includes companies like Scytl (technology for reliable electronic voting that led them to be selected for the USA presidential election) or Sócol that applies social sciences to social innovation and urban policy. However, PRUAB wanted us to help them ideate a space where they could explore new visions on their own mission and ways of working. 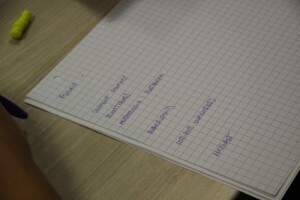 This is how the “Laboratory of Ideas” project started to take form. Following our line of work, we co-designed with PRUAB’s management and staff a whole process to… further co-design with users and stakeholders research and innovation projects. In fact, what we have done is to design a process to allow for collective design to take place in research and innovation. We have facilitated several very active sessions with researchers, companies, entrepreneurs and users. From them, several things have emerged: joint research projects between companies and university researchers as well as embryos of new spin-offs. A small new community is slowly growing around these projects. PRUAB is trying hard to further boost it by including new interactions, which go far beyond the usual “networkings” or Community of Practice frameworks and that are rooted in the processes of co-creation, prototyping and co-design which we have successfully applied to various domains of activity. For us, the best indication that something new is happening at PRUAB are the content and quality of the multiple interactions and interviews we’re having in the process. 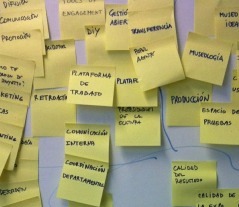 “We are changing the way we think and act” commented several staff PRUAB members who consider themselves our co-designers in this process and who have dared to embark with us into it, attracted by the reputation of La Mandarina de Newton as the creator of highly creative process based on design. We are just at the beginning of a user-centered design process that operates at different levels. At one level it is a process aimed at creating new ideas and projects, including start-ups. On the other level, and from the perspective of the PRUAB Science Park, the process is in itself a exploratory prototype for finding new ways of operation, new services, new ways of organizing PRUAB. Also at this level, we follow a design process. 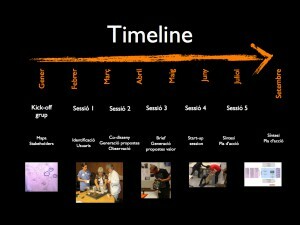 A co-design session with the management and staff of PRUAB: the process timeline and details were the result. 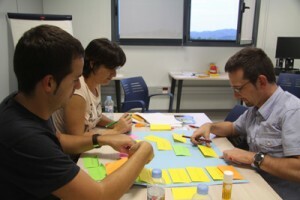 A co-creation session with researchers, companies and stakeholders: innovation project ideation and user identification. Review of the proposals by users. Co-design with them. Review and creation of business models. Invitation to developers to join in the project. Refining the business strategy. Retrospective reflection and analysis of the entire process with PRUAB: redesign of services. All along the whole process, we conduct intensive ethnographic observation in order to detect what might be of interest for the skills, capabilities and attitudes of all participants, both an innovation proposals and PRUAB organization level. For us, it was clear from the beginning that users should be involved in helping to give form to ideas conducive to innovation projects. It was a great joy to see how we were able to transfer some co-design capabilities to researchers, entrepreneurs and staff so they could test emerging ideas of their own projects with the possible future users. The Park management estimate that for this self-prototyping process we had to start from a clear focus. So we agreed to focus on the issue of aging so that general focus and direction was given. This made easy for users and stakeholders to relate to the process they were invited to take part in. The first session with management and staff at PRUAB allowed them to find the current constraints and limitations that being a Science and Technology Park imposes on innovation processes. We also were able to spot opportunities and stakeholders and relevant user groups related to aging. The second session energized more than fifty people from various areas and get them to devise projects and prototypes of new products and services. The third session was the acid test: we got entrepreneurs, technologists, social workers and researchers to discuss their proposals directly with their potential users. 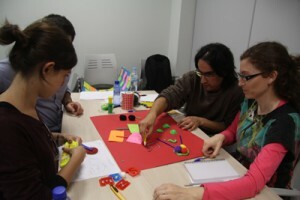 The session had a very strong energy and allowed many projects to be “landed” into practicality. Also, it was an occasion to train participants in the difficult and ambiguous conversation skills needed when working with users. In a way, we help proponents themselves to work as designers. One. Because we are creating a new space that wants to exploit the great capabilities of the PRUAB by connecting them with the users. Traditionally, both researchers and technologists (and partly business people) still work isolated “in love” with their own idea, in their own bubble. This path leads to products that not necessarily respond to real needs, if, however, they incorporate the latest research. Hopefully, of course, some of them could end being truly disruptive. Aging is a complex problem with multiple dimensions and different users. Listening to users can give clues about how to improve an initial proposal or how to create something completely new after seeing their reaction. To give you a hint of typical insights coming of this we can cite the example of what happened when a user, after being told about a proposal to electronically control the falls of old people in their homes, said: “But falling is really an exciting thing. In this way people come home to meet me, and help me. Although the caretakers who usually rush home, “could talk a little more with me”. Is the fall the only “problem” here? Are there other opportunities for new solutions to other problems? By making researchers and entrepreneurs practice the bare minimum user-design skills we help them value new opportunities and the role of design in the creation of their intended innovative service, product or spinoff. And it gives a lot of value to a Science Park if it can offer these services. Two. Start-ups that focus on product results need design to have an impact (See, for example, http://startupsthisishowdesignworks.com). The sooner the better. Not all startups can become design-based innovating companies like Apple. However, how much value can a proto-Johnathan Ive add to a start-up in PRUAB? How can the researchers / entrepreneurs appreciate the importance of design in the future of their project if they are not exposed to the practice of design while preparing their projects? We are working with PRUAB to identify new services in this regard. Three. If the design (and co-design) attitude is shared by management, staff, stakeholders, and users, the community that is emerging around PRUAB’s “Laboratory of Ideas” has a ‘color’ that goes well beyond the usual interactions that occur in these environments whether in the form of “networking events”, communities of practice or tech transfer services. The PRUAB, by adding new activities based on the practice of shared design is launching an important message to the community of science and technology parks. Four. We know it works: after being in contact with the accelerators of various spaces, we are convinced that the processes of, for example, Navy Yards in Brooklyn where the design is in the early stages of creating start-ups and designers are part of the equipment founders of spin-offs works. We have no doubt about it. On Wednesday November the 2nd, we run the second session of the workshop “Living Experiments“, part of the TalentLab project, at the Agrigenomics Research Center (CRAG, CSIC-IRTA-UAB). We continued working with the same groups as the previous session. This time, though, we had three new members and a missing one. The three groups summarised the initial ideas of the resource proposals that they had defined in the first session. They also added new contributions from the reflections that participants had done online between the two sessions. 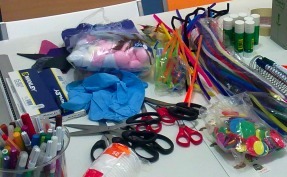 From there, the groups did a 3D prototype model of each of the proposals. The idea was to think with their hands using low tech materials to better visualize the resources and to identify areas for improvement that have not been taken into account. The first group proposed a cooperative resource based on bio-energy in order to disseminate their current research in the production of clean energy using living organisms such as microorganisms or transgenic plants. The idea was to provide an online platform for generating informed debates. The second group proposed the creation of a big challenge contest focus on fighting againts human hunger on our planet. Under this proposal, students were asked to offer solutions from different perspectives (scientific, social, North-South relations, etc..). This proposal was also based on an online platform. The third group proposed the design of an ecological footprint graphic adventure. The goal was to make students became more aware of the unsustainability of the nowadays consumption of energy. At this point, in which the proposals were already quite defined, several iterations were made to refine them. Each group received two people from another group that raised doubts and questions about the educational resource, assuming the role of the character he or she had created in the previous session, ie, a hypothetical end user. This activity was repeated twice changing groups of people. Later, the members of each group met again to discuss the feedback they had received from the hypothetical users. Each group defined its education proposal in its final version. They filled a matrix with concrete and concise information about their educational resource proposal: main topic, worked concepts, audience, methodology, technical requirements, feasibility, possible difficulties, budget, etc. The groups presented their proposals taking into account these aspects. Finally, they all proceeded to vote individually for the proposal they liked the most. The result of the voting process was a tie between the second and third proposal. This hold into a general discussion. Among other issues, participants proposed to include the positive aspects of the first proposal into the most voted ones. 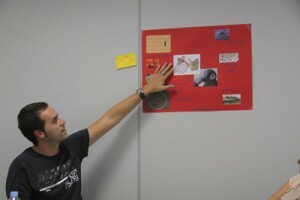 They also studied how to integrate all the ideas into a single proposal. Thus, we concluded the first phase of the work. From here we will consider the three proposals, the results of the voting process and the possible integration of all of them in order to produce a final online educational resource. In this second phase, the TalentLab team will continue to ask for the participants contributions! Laura Valls. Unitat de Cultura Científica Delegació del CSIC. Irene Lapuente. La Mandarina de Newton S.L. 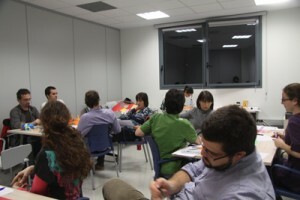 Some days ago we held the first session of the workshop “Living Experiments“, part of the TalentLab project. It took place at the Agrigenomics Research Center, (CRAG, CSIC-IRTA-UAB) a research center of CSIC, the Spanish Sperior Council for Research. The session’s design included an intense working dimension. But, first, to warm up, we started with a visit to the CRAG premises. It was led by CRAG researcher Ana Caño who provided very interesting explanations. It was during the visit to the CRAG greenhouses that the participants in the workshop (researchers and school teachers) started to show their interest in the questions that the session was meant to revolve around. Starting from these interests, as we had planned, we moved on to get to work in one of the CRAG work rooms. Irene Lapuente from la Mandarina de Newton S.L -CoCreating Cultures- started by explaining the structure of the workshop to the participants. In no time everyone was hard at work! They organized themselves into three groups. By using different techniques, we facilitated different discussions within each group and a general one as well. 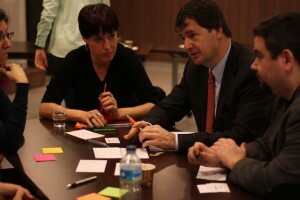 Step by step, the attendees become more familiar with co-creation processes. The first activity, to spark inspiration, started generic discussions about the relationship between science, education and society. The first group remarked the role of the different fears (fear to change in general, of nuclear power, of trangenics) in understanding the relationship between science and society. The second emphasized the role played by the media and educators in creating a predominant image of the animal kingdom in the collective imagination (making plants and vegetables much less prominent in comparison). Finally, the third group picked the goals of improving quality of life and general well-being as an important guiding princple for scientific research which, however, operates under anthropocentric premises. After this, a more exploratory activity started. Participants were asked to identify challenges for education in the mid-long term (2030). There were significant coincidences between the three groups. All of them gave a key predominant role to the energetic challenge. There were specific contributions and variations on this subject. The first group projected a significant geopolitical shift, motivated by China becoming a global superpower. The second group anticipated a positive twist in the social consideration of researchers and school teachers. The last group envisaged an intensification of conflicts related to natural resources, specially water. The participants defined the profiles of the users of the educative resources that will eventually be the result of the Talentlab project. They resorted to their own experiences or their imagination to depict the main traits of these future users. They were described as people familiar with new technologies -although they did not necessarily knew them in depth- who had low motivation, were skeptical about everything and had little confidence in their own abilities. 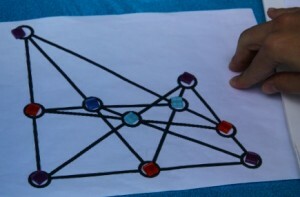 The last activity consisted in building an affinity diagram from elements that had emerged from the previous activities. 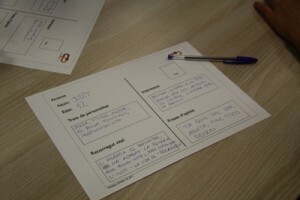 The first group ideated an activity for the classroom about energy using participatory methodologies. The second group created an experiemental activity that should help in creating a direct relationship between researchers and students. The third group proposed to create a graphic adventure about energy. All along the session the atmosphere was relaxed and favourable for working. Participants were able to move from very general discussions to a first levell of workable detail. From now until the next session (novembet 2nd) the groups have engaged themselves in an imternal documentation activity that is taking place online. The project is based on co-creation workshops that explore life sciences, environmental chemistry, earth sciences and artificial intelligence concepts. The registration period is now open! CSIC, through its Science Culture Unit in Catalonia and some of the CSIC research centers, and la Mandarina de Newton SL, have set up TalentLab, a project conceived as a co-creation laboratory of online educational resources for the classroom. TalentLab mixes professionals from the scientific and educational community in order to add ideas, efforts, abilities and talents, and co-design science education resources. It is aimed at teachers of upper primary, secondary, further education and vocational training. TalentLab foresees the completion of four workshops, each of two sessions each of it, on different scientific disciplines. The registration period for these workshops is already open. You can register through the project website: http://talentlab.csic.es. The first workshop takes place on October 19th. It is called Living Experiments and it will take place at the Genomics Research Center (CSIC-IRTA-UAB). This workshop goes around the theme of model organisms, or laboratory organism. During the workshop, which will continue in a second session on November 2nd, we work in groups in order to co-design an online educational resource. Following the same structure we have organized three more workshops: React with the Environment is based on chemistry and environmental issues. Its is going to be held at the Institute of Environmental Assessment and Water Research (CSIC), on the 23rd and the 30th of November. Hearing the Earth is about the dynamics of the Earth. It will be held in the Ebro Observatory (CSIC-URL) on the 25th of January and the 8th of February 2012. The last workshop is Around Intelligent Machines. It deals with research on artificial intelligence and it will be held at the Institute of Artificial Intelligence Research (CSIC), on the 7th and the 21st of March 2012. Educational resources resulting from these four workshops will have been co-created by members of the science research and the education community. 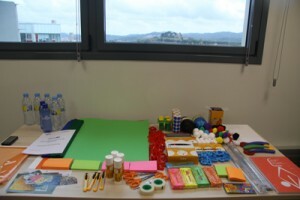 The idea is to produce high quality products that satisfy both researchers and teachers. TalentLab is an innovative project that aims to generate debate, dialogue and innovative products in order to foster scientific creativity in young people. It is an initiative of the Culture Unit of the Scientific CSIC Delegation in Catalonia, in collaboration with various research institutes of the CSIC in Catalonia and la Mandarina de Newton SL. It si financed by the Spanish Foundation for Science and Technology (FECYT) and has the support of the Educational Coordinating Council of the Municipal Institute of Education of the City Council.